I had a moment of crystal clear resolve yesterday, that I would no longer abide people in my Facebook network who were being cruel, hateful and unnecessarily vitriolic. It was one person who said some things that was the catalyst for me. I sat down and wrote a post, similar to many others that I'm sure you've seen. Generally speaking, I'm a pretty easy going guy on social media. I don't get too bent out of shape when friends drop the occasional F-bomb or get upset about something and vent. I block, unfriend or unfollow rarely. I had a distant cousin who was using words so vile with an intention that was equally so, that I stepped away from that connection. I have also chosen to sever ties with a few individuals who became abusive, in the political sense, even though I was no longer involved as an elected official. But my filter is going to be enhanced from now on in. I get so much value from friends I know a little and friends I know a lot on social media. I'm grateful to them all for the things they share; I am inspired, entertained and informed every day. But if I notice individuals who are actually taking away from my experience, I am no longer going to hesitate to filter them out in the most appropriate way. I feel good about the decision. Obviously, I wasn't alone in my feelings, as the simple Facebook declaration was widely liked and commented on. Several people shared privately that it made them rethink the way certain people were affecting them in a negative way and took action. 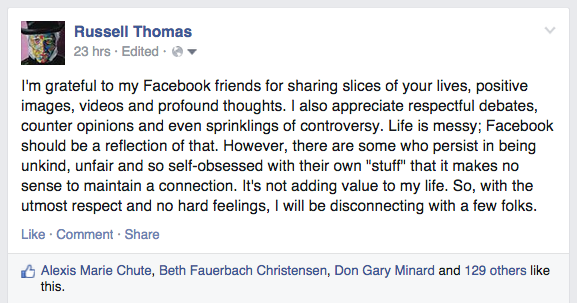 I'm grateful to my Facebook friends for sharing slices of your lives, positive images, videos and profound thoughts. I also appreciate respectful debates, counter opinions and even sprinklings of controversy. Life is messy; Facebook should be a reflection of that. However, there are some who persist in being unkind, unfair and so self-obsessed with their own "stuff" that it makes no sense to maintain a connection. It's not adding value to my life. So, with the utmost respect and no hard feelings, I will be disconnecting with a few folks.